After whining a lot about this crappy weather and longing for hot summer days spent on a beach with an icy drink in our hand, I decided it was about time to embrace autumn with its ups and downs, surely I don't need to mention the "downs" we pretty much know the moody rains and sunless days. As in concern to the "ups", autumn always reminds me of my childhood, when I would gather bouqets of leaves to take them to my mom or collect chestnuts for no reason. Fall has its charm, it's the season of juicy apples and grapes, of hot chocolate and cozy sweaters, so yeah, I'm planning to enjoy all that and forget about the nasty weather. How about you? The theme of the Mish Mash Challenge - cold - goes perfectly with this time of year, but I didn't get ahead of myself as I wanted to do a review of some studs that I received from Born Pretty Store. A more proper display of autumn nails you will see on Saturday ^^ Anyways, I had this design in mind for a while now and finally got the chance to do it. I hope you like it! It's an easy nail art but eye-catchy. If you want to know more about these studs click here, I for one really like them! This particular wheel has studs in two sizes and two colors (gold and silver). I've put on my nails studs of different sizes so you can see that even the bigger ones aren't actually that big. I've told you before that studs can be reusable if you handle them with care (its best not to use top-coat over them). I've used the same studs in three different manicures, now isn't that economic? See what I'm talking about in Pastel Gradient, Take me to Hawaii and Taping+studs+glitter equals pretty. Studs can bring that extra something that your manicure needs, we've seen them everywhere - on your shoes, clothes, bags...why not on your nails? If you decided you want these in your life, your nails will definetly be grateful, 'cause they will literally pop and receive lots of compliments. 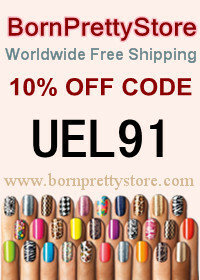 Don't forget to use the code UEL91 for a 10% disscount. 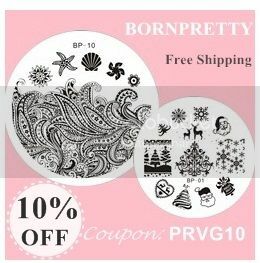 The Born Pretty Store site is PayPal verified and has free shipping world wide. What more can we ask? P.S.1 If I haven't conviced you with these ones you can take a look at a bunch of other shapes and sizes and even different colors; how do neons sound? Awesome mani and I love those studs so much! That first paragraph is brilliant! I love Fall for all the reasons you listed and more :) Beautiful manicure as well! E pur si simplu superba manichiura ta! I love your gradient ^^ Looks like a cloudy mountain! I love your mani, so pretty, but I HATE your mani too!!! It reminds me too well of cold, rainy, icy, snowy days to com. Boo cold, yea hot!! Ooh, I love this hot & cold mani! I love the shades used on your cold nails and your hot nails is beautiful! I think I'm going to order those studs - thanks for the discount code! Love it! And I adore Born Pretty studs. I really just love born pretty. Which reminds me - I have stuff I need to review for them! Yikes! The gradient is really pretty, and I love those nail studs!